Students at a Canadian university voted to kick out their only Jewish representative from the student government board of directors this week, after he was named unfit for the position due to his active role in the Jewish community. Noah Lew was one of a dozen board members of the Student Society of McGill University (SSMU) who were to be ratified in a single, block vote at a Monday night general assembly meeting, a process usually considered a formal obligation. After members of SSMU, who have been identified as leaders in the campus pro-boycott, divestment, and sanctions movement, successfully demanded that each director instead be ratified individually, Lew was voted out 105 to 73, with 12 abstaining. Two other directors who had been vocally anti-BDS, Josephine Wright O'Manique, and Alexander Scheffel, were also removed. The action came after Democratize SSMU, an ad hoc group created to resist a decision ratified at the start of this semester that a pro-boycott resolution was discriminatory and therefore unconstitutional, waged a campaign specifically targeting Lew. In a now-deleted social media post, re-published by a Jewish blogger, Democratize SSMU wrote that the affiliation of Lew and two other Jewish representatives with the Canadian Jewish Political Affairs Committee (CJPAC), which is pro-Israel, presented "conflicts of interest." They represented the nexus of political power and corruption that had brought down the boycott efforts, wrote the group. Democratize SSMU later wrote they "apologize unreservedly for the harm that was done through some of our campaign material," calling the original post "insensitive to anti-Semitic tropes of Jewish people as corrupt and politically powerful." SSMU President Muna Tojiboeva wrote on Wednesday that she is "shocked to see such a blatant expression of anti-Semitism" from the general assembly. McGill Principal and Vice Chancellor Suzanne Fortier announced in an email to the university community that an investigation has been launched into the incident, and a task force appointed "to examine more broadly such matters and to make recommendations on how to ensure that our values and principles of academic freedom, integrity, responsibility, equity and inclusiveness are respected." David Naftulin, a Jewish student who attended Monday's meeting, told the Washington Free Beacon the incident is part of a much larger problem. "When progressives hear historically oppressed people speaking in a relatively unified voice and telling them something is discriminatory, they are usually very receptive. They work hard to face and fix the problem," said Naftulin. "But not with Jews. No, we have to explain and prove why we think something is anti-Semitic." The Lew incident "might be the wake-up call for McGill and the broader Canadian university community," said Naftulin. "But, we've said that before and nothing really seems to have changed," he added. Lew, who remains a student government vice president, wrote in a Facebook post that while the ordeal has been "incredibly upsetting" and "horrible," he is happy "the discriminatory agenda of BDS McGill that has been swept under the rug for years is finally out in the open." "Time and time again, we have heard the phrase ‘BDS is not anti-Semitic,'" wrote Lew. "If BDS is not anti-Semitic, why did a BDS-led campaign name and shame me for my affiliation with a Jewish organization, and call on students to remove me from student government for this reason?" 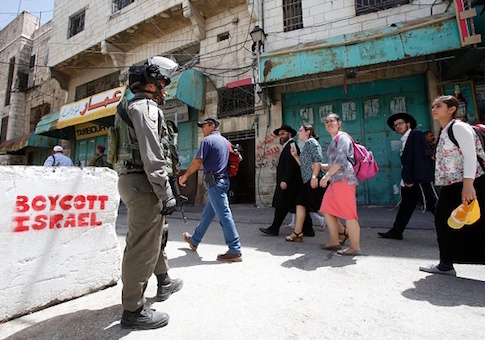 A petition from Jewish human rights organization B'nai Brith Canada demanding McGill take swift, decisive action has gathered over 3,000 signatures. Monday's incident follows revelations last year that a McGill student representative had tweeted encouragingly for his peers to "punch a Zionist." That student was consequently removed from all his government positions. This entry was posted in Culture and tagged Anti-Semitism, Canada. Bookmark the permalink.